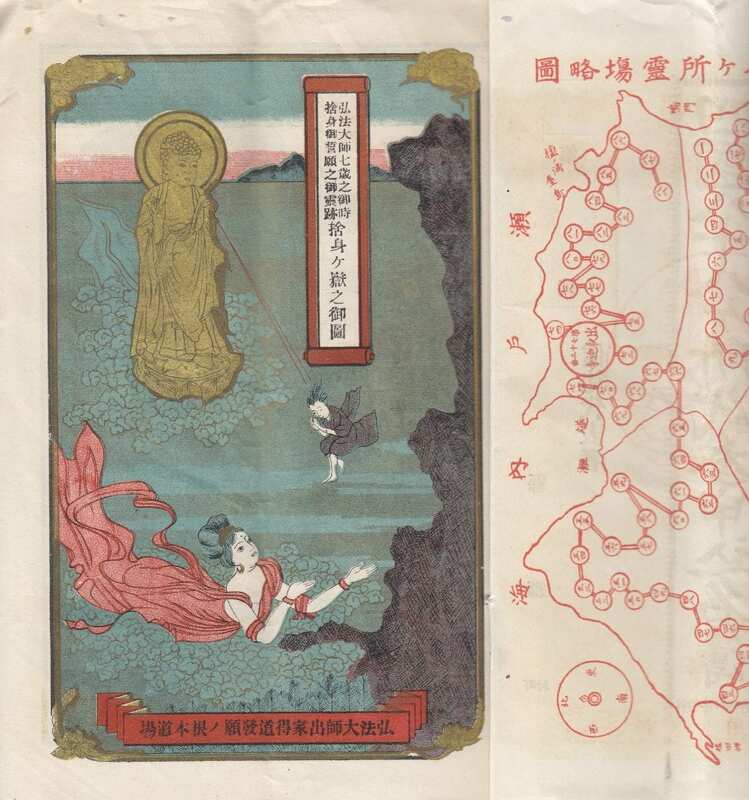 It is almost impossible to talk about the Shikoku pilgrimage without mentioning the name of Kūkai (空海:774-835), or his posthumous name Kōbō Daishi, the renowned Buddhist priest who founded Shingon Buddhism in Japan during the 9th century. His name permeates Japanese history and there are countless stories based on legend and fact about his life and accomplishments. We know that he was born in 774 near the present-day Temple 75, Zentsū-ji (善通寺) in Kagawa prefecture and was given the name of Mao, but details about his childhood are few and perhaps unreliable. One interesting story is that about 500 meters past Temple 18, Onzan-ji (恩山寺) in Tokushima, there is a small plot of land with some gravestones, stone footsteps of Buddha, and a building with the name of “Kōbō Daishi’s diaper hut.” (弘法大師おむつき堂). According to sources from as early as 1923, it is said that when his mother came to visit him here in 815 she enshrined some of his nappies in the hut here, but why she did this no one will ever know? For further details on his childhood the website of Mt. Kōya, the headquarters for Shingon Buddhism, states: The childhood play of Mao involved making Buddhist images in the dirt, collecting grass and wood to make shrines, and worshipping the Buddha. At about seven years of age, he scaled the nearby Shashin ga dake peak (捨身ヶ嶽) and prayed to the Buddha, “When I become big, I want to aid the ailing. If I shall have that power, please bless me with a long life,” and he jumped into a ravine. Thereupon, from somewhere, a rather beautiful sound was heard, and a celestial maiden appeared who took Mao firmly into her grasp.” The peak can be visited behind Temple 73, Shusshakaji (出釈迦寺) in Kagawa prefecture, but please don’t take a leap of faith as he did. According to legend, Dōgaku-ji (the temple of learning as a child), was founded under a different name by the well-known Buddhist priest Gyoki Bosatsu (668-749) by the command of Emperor Tenmu (reign 673-686). It is considered to be the oldest temple in Shikoku and the name was changed to Dōgaku-ji after Kūkai stayed here. Then, in 815, when Kūkai was making a pilgrimage around Shikoku he revisited the temple, built more buildings, and carved statues of Yakushi Nyorai (main deity and national treasure), Amida Nyorai, Kannon Bosatsu, Bishamonten, Jikokuten, and Kankiten. After this nothing is known about the temple history until the Muromachi period (1336-1573) when the temple was enlarged and prospered, but during the Tenshō period (1573-1592) almost everything was destroyed by the troops of the warlord, Chōsokabe Motochika (長宗我部元親: 1539-1599). After a period of disuse, several buildings were restored during the Genroku period (1688-1704) and then in 1868, a new eleven-meter main hall was constructed and the statues that Kūkai carved were moved in here. The old main hall became the Daishi hall, and people pray to the young Kōbō Daishi enshrined here for help to pass school examinations. In fact, you can see wooden amulets hanging beside the hall for this purpose. To one side of the Daishi hall, there is a corridor with eighty-eight statues of the main deities from the Shikoku pilgrimage. On the other side is a building containing statues for the twenty sites of the Bekkaku pilgrimage. One is of a sleeping statue of Kōbō Daishi covered with quilts representing the place in Ehime prefecture where he had to spend the night sleeping under a bridge while he was making the pilgrimage around Shikoku. There are also thirty-three statues of the main deities from along the Saigoku pilgrimage route located in the Kansai area of Japan. Walk between the main hall and temple office and you will see the spring that Mao used when he practised calligraphy. The water is called “Gohitsu no kajimizu” ( 御筆の加地水 ), which means “the prayer water of the brush” and it is said that if you drink the water that you will be cured of any illness. You can fill your own bottle for free or pay 200 yen to fill one of the bottles provided. 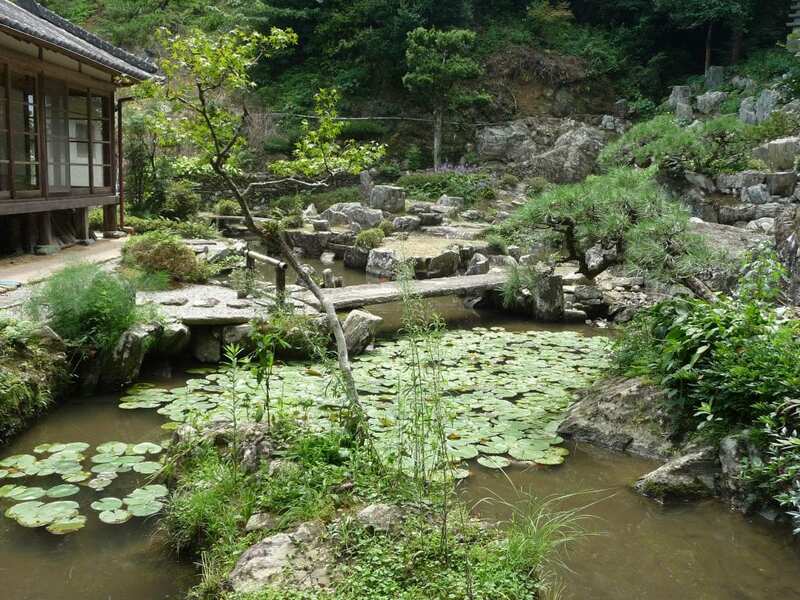 Across from the spring is a garden where it is said that Mao took walks in. Admission is 200 yen. Dōgaku-ji has been designated as No. 2 of the twenty Bekkaku (別格) “special other” sacred sites around Shikoku. Others in Tokushima prefecture include No 1. Taisanji (site of an annual rice cake carrying festival), No. 3 Jigen-ji (with the very narrow caves called Anazenjo) and No. 4 Saba Daishi (site of the story of fish (saba) and Kobo Daishi). Note: On March 25, 2017, around 5:30 pm a fire burst out at Dōgaku-ji destroying the wooden main hall (hondo) and the two-storey priests’ living structure and kitchen (kuri). The wooden sitting statue of Yakushi Nyorai, which is a nationally designated important cultural asset, was safely taken out of the main hall by the resident priest. This article was first published in the October 2015 issue of Awa Life.